So VE went underground with his investigative gnome staff to gather the evidence. Don’t mess with the gnomes when they want to find something. We found their fake 70s outfit..
And we did what any self respecting gnome would do. We filled a paper bag full of Tang and lit it on fire on their porch and then rang the doorbell and ran. 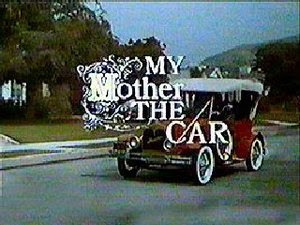 The Jerry Van Dyke show was ere my time but I know the song ( unfortunately ). My! the gnomes Have been busy! i can't get past the pork brains in a can. EWWWWWWWWW is all I can say. At least in that house, if a kid is being bad he won't be made to go sit in the corner. Cheers!! VE, you know the first rule of Captain & Tennille Club is don't talk about Captain & Tennille Club! I loves me some Pork Brains...fried in butter even better. Muskrat Love was elevated to new heights once I heard Billy Bob Thornton sing it in "Pushing Tin." And thanks for the spoof. I suspect your gnomes are trying to get into my header. Maybe we can work something out for some...ah...herb. Hey, I know where that house is!! 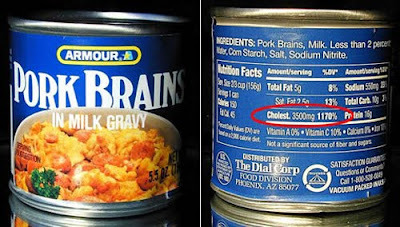 OMG, the pork brains look like instant stroke in a can... So, are you one of those gnomes....hhmmmm? mrsupole - And you've said it well! matt-man - Ha! Good point. Actually...the legs are hollow; they stuff them down those. prefers - Ha! Perhaps we can. The gnomes love messin' with headers. candie - They know we know...let's all go to Reno. See...I just have them a whole new jingle. winky twinky - I don't gnome what you are talking about! beth - Yeah, you're back. No bears I hope. Now you should be ashamed of yourself for missing all of the important posts here. Stand in a corner until you finish reading all the back posts...or not. Only thing more explosive than TANG in a bag, would be to replace it with powdered coffee creamer( not that I would know that or anything )...oops! VE, I discovered that one much later, in the Navy, heh, heh...but I figured if TANG could do that, well why not cof....hey back! Get back! The gnomes have invaded! ( using secret weapon... )Take that! And that! Oops! Sorry 'bout that; was havin a flash-back! VE, that hairy shirt was disgusting with a capital DIS! AND...one of your gnomes has gone rogue! I'm seeing on the Travelocity commercials. Time to bring out the belt and get that gnome and bring him back where he belongs...safe in the hair of your arm pit! I think you need to wear one of those shirts and the shoes while singing Muskrat Love. 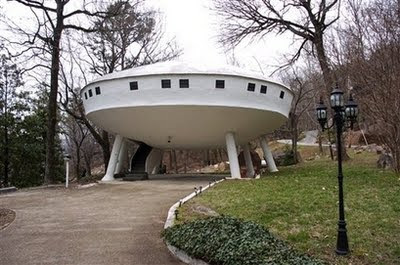 You can take a picture of yourself outside of the spaceship house. Oh, those are just photos? Now that's what I call investigative journalism! Pork brains aren't very good, unless they're in milk gravy! And I didn't know people did that with Tang. In my town they used dog poop. Alan - Is there really any other kind of gravy? kurt - When it comes to Alan...you're such a yes man. I have a friend in South Carolina that actually eats those things . . pork brains . .milk in a can . . God I'm gagging just thinking about them. At least you filled the paper bag full of Tang . .some would have put something else in it! I commented earlier about Scully and Mulder. I've lost it though. V.E. the trolls got me again. ONce again I commented this morning and when I check back to see if you slipped in a secret post I see my comment has disappared. Why do the trolls not like me? Am I not stinky enough? I prefer my pork brains with scrambled eggs. Yeah, I like my brains scrambled? gladys - Well this one made it. I don't know what is going on. Perhaps the aliens know. I mean they know that we know...you know? I'm lookin' for some Muskrat Love in a can. Gnome help please. VE, it's Elizabeth and Janaverse. They are the aliens that is why they have one more comment than me. I would watch out if I were you or at least call Mulder. lol. tang, eh? did you wear your aluminum foil hat to make sure to scramble the waves they are sending...if that shirt is real, you know someone is wearing it somewhere and that thought beats pork brains any day. Joe-Bob: Y'know, Billie Sue, I really like them there Pork Brains, but how can we find a way to get rich mass-marketing them for all them weak-kneed Yankees up there? Billie-Sue: Oooh, I know! Let's stick 'em in a can with some MILK GRAVY! Milk gravy can fix ANYTHING. Them suckers'll be irresistible! Joe-Bob: 'Ats why I love ya, Billie-Sue. Put down that cigar and come gimme a smooch. Bring a beer with ya. that shirt is horrible! burn it! jaime - Does hair burn or just melt? "it's Elizabeth and Janaverse. They are the aliens"
Drat. Now I have to visit Gladys with my memory-erasing Zap-O-Ray this weekend. As if my schedule wasn't already full. janna - It's tough being an alien! 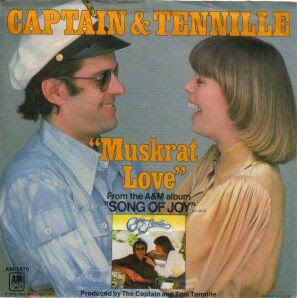 i'm not sure which is more disturbing, the hairy t-shirt or the captain and tenille. That shirt literally made my skin crawl. maureen - Come on...it was the 70s look! the feet and shirt photos creeped me out. Pork Brain?? IS that for real?? YUK! 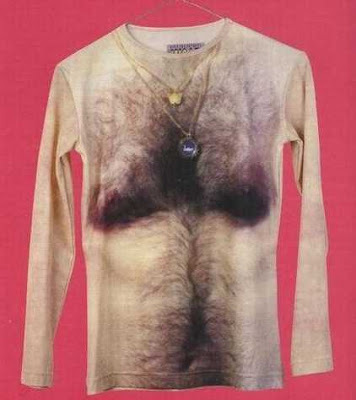 And that hairy shirt is a great way to keep women away!! lol! EWWWW! I wonder how it would look on me?? ?